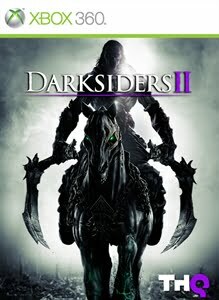 If Darksiders II could be described in one word it would be epic. However, that word both describes what it does right and what it does wrong. From Vigil Games, Darksiders II is an amalgamation of three games: God of War, The Legend of Zelda, and Prince of Persia. Different aspects of these games are utilized throughout your journey playing as Death, a member of the four horsemen of the apocalypse. Luckily, you don’t need to know that Death is a horseman or a nephalim or the Bible at all for, like God of War before it, Darksiders II creates its own fiction and its own world. It only borrows from the Bible just as God of War borrowed from Greek mythology. In Darksiders II, Death is trying to prove the innocence of his brother, War, who you played as in the original Darksiders. War is being tried by a higher power for exterminating humanity and, in order to clear him of these crimes, Death tries to restore humanity to earth. The story is epic in scale (see? I told you it was an epic game). It pits the depths of hell with the heights of heaven, each fighting over and for mankind. The only critique on this grandiose story is that it can get convoluted. This happens especially during the opening cinematic (which is visually awesome, but we’ll get to that) where the plot jumps between two different stories. It doesn’t help to have played through the first game, either, because it deals with the backstory of both War and Death which is something we did not receive in the first Darksiders. The story is interesting but eventually falls under its own weight, creating a gap between interesting and understandable. However, without focusing on the details and simply taking the overall gist of the story, the player can have fun with the grand battle between a blurred good and evil. The gameplay also revolves around the three games mentioned above. You button-mash during combat much like God of War. You traverse the levels by jumping across beams, running along walls, climbing random wood pillars, etc. much like you do in Prince of Persia (to the point where the textures look exactly the same between both games). And, you open chests in dungeons to find dungeon maps and even use growing bombs much like The Legend of Zelda. All of this makes for a fun game. The dungeon design is easy to navigate without taking away the fun of finding keys, unlocking doors, and fighting bosses. The combat, while less intricate than God of War, can be fun with unlocked abilities and upgrades. The main problem lies with the traversing of the levels and the controls in general. The controls for the climbing and the jumping are easy to understand and use, in theory. However, when pressing one button, another action often ensues, and the camera makes it more than difficult to know where you’re going. These controls and camera issues also plague the combat. I often found myself pressing the buttons to dodge in one direction only to roll right into an enemy. All of these cause constant death or at least enough death to become annoying. The combat only becomes frustrating due to constant dying during boss battles but, even with this problem, the boss battles in this game are still loads of fun. Each is epic in scale, sometimes literally (in regards to size) and other times the battle itself becomes epic. The first boss breaks through a wall and instantly begins to drill you into the ground and the game gives you a split second to get out of the way before it happens. Each battle ends in a killing animation that is comparable to many CGI cinematics and are just awesome and fun. The graphics in these boss battles are amazing but that can be said for the entirety of Darksiders II. The environments vary from dungeon to dungeon and area to area, from the insides of a fire-brimming volcano to water ridden expanses. The areas between dungeons are vast and breathtaking. The worlds (there are multiple) are continuations of giant vistas that span across the areas you explore. The problems with enjoying all this beauty is the camera. While there is minor screen tearing when traveling quickly on your horse, it only briefly takes away from the experience whereas the camera always focuses on the backside of Death. This focuses the camera on the ground rather than the elaborately crafted environments and even when you try to bring the camera up, it refocuses instantly. It’s a shame that the player isn’t able to enjoy the scenery when its obvious the developers put so much time into it. The feeling of vastness that these levels invoke comes due to the wide areas you must traverse on your horse. The horse itself looks great and its animations were accurate as to what a horse would do under certain situations (or at least, as accurate as a horse on fire can be). However, the world itself, for being so large, offers nothing for the player to do other than fight enemies and find chests. I don’t know how I feel about this because I often found myself spending minutes on the horse to get to the next dungeon but this big space also lends itself to the giant world Vigil Games is trying to create. The payer gets a deeper sense of the massive size of the world by knowing how far things are from each other but this doesn’t contribute to the game’s fun. Ultimately, a smaller, more concise world, or a large world with something to do in it would have made for a better game. This world is still realized, though, through both the aforementioned graphics and the sound. Everything from the clopping of the hooves to the thud of a sword against an enemy is expertly done. The best and most apparent aspect of the game’s sound is the score. At all the right moments during the game, the music kicks in with epic orchestral melodies that get you ready to destroy something. The boss battles become even greater when the music picks up and the thuds and clatter of your weapons clash against a boss. Darksiders II could have been the whole package. The graphics are beautiful. The sound is impressive. The controls are simple and fun. However, camera issues and the controls not always working hinders the game and causes the player to experience frustration at fighting the game itself rather than fighting those inside the game. Even with these issues, Darksiders II can still be fun and its epic scale is something to witness yourself.